Stovetop Sausage Mac and Cheese makes a hearty family meal and it can be made in under 30 minutes using only one pan. I love the flavor that ground sausage adds to mac and cheese and the fact that it makes it feel more like a main dish. It’s every bit as delicious as this Super Creamy Mac & Cheese. I like to use Johnsonville All Natural Fresh Italian Mild Ground Sausage. 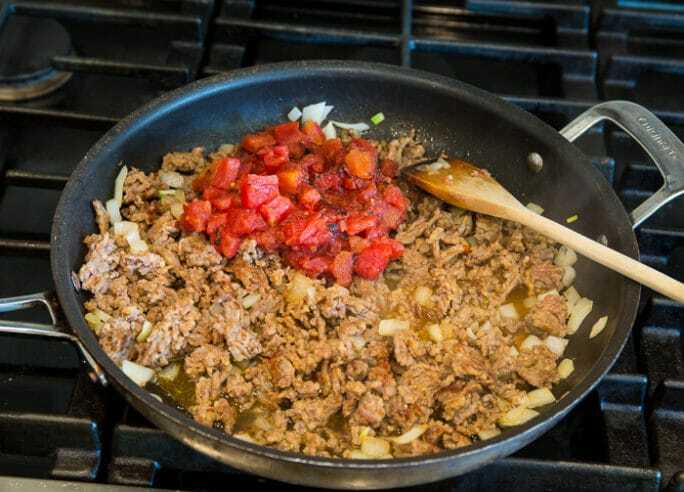 It is so convenient and easy to cook with because it comes packaged the way ground beef does . Just unwrap the package and toss the sausage in a pan to brown it. There’s no need to get your hands all messy trying to remove the sausage from casings. 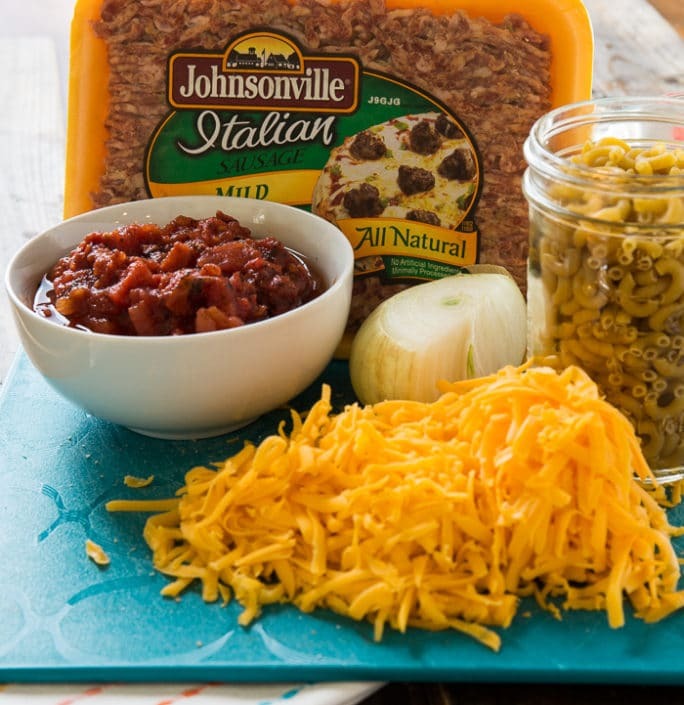 Johnsonville Italian Mild Ground Sausage has so much depth of flavor with the perfect blend of Italian herbs and spices. 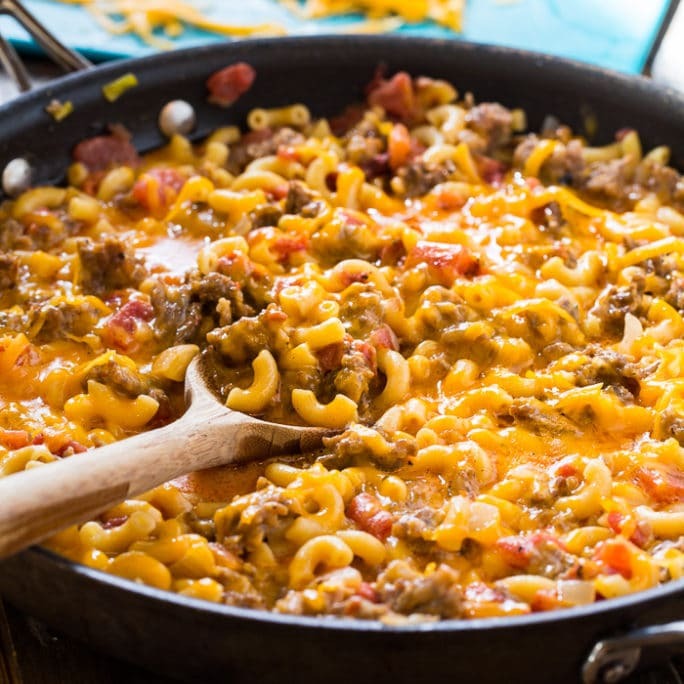 Because Johnsonville Italian Mild Ground Sausage has so much flavor, only a few ingredients are needed to make this cheesy and delicious mac and cheese. I like to cook a little onion with the sausage. Once the sausage is cooked and crumbled, I add a can of fire-roasted diced tomatoes, 2 cups of water, 1/2 cup of half-and-half, and an 8-ounce package of macaroni. Let it simmer until the macaroni is cooked and then add 2 cups of shredded cheddar cheese. It may look a little liquidy at first but once the cheese is melted and mixed in and it cools slightly, it will really thicken up. Stovetop Sausage Mac and Cheese couldn’t be easier to make and there are hardly any dishes to clean. 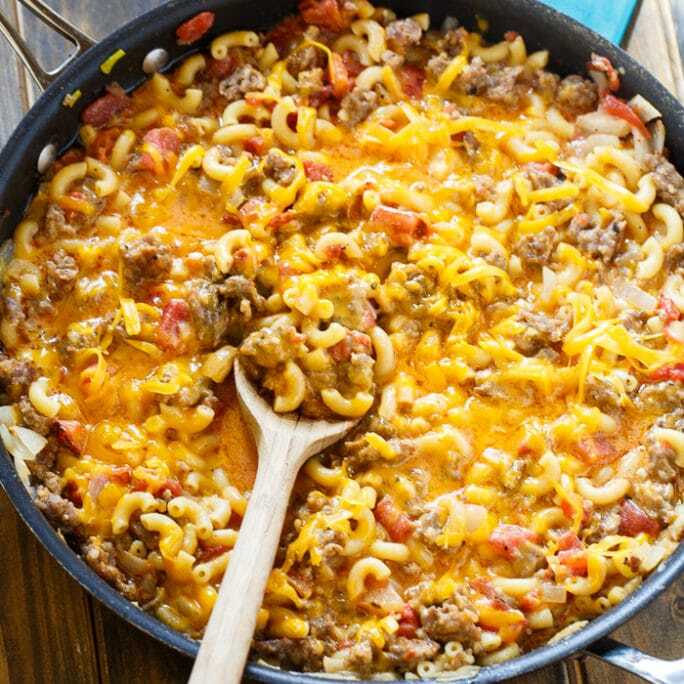 Got to love a meal that can be on the table in under 30 minutes and is so cheesy and satisfying with a bite of yummy ground sausage in every bite! Stovetop Sausage Mac and Cheese is super cheesy and can be made using only one pot in under 30 minutes. Place sausage and onion in a large nonstick pan over medium-high heat. Cook, breaking sausage apart with a wooden spoon, until sausage is no longer pink. Add diced tomatoes, water, half-and-half, and macaroni. Cook, stirring frequently for 12 to 14 minutes. Season to taste with salt and pepper, keeping in mind that the cheddar cheese will add some saltiness. Sprinkle cheese on top and stir until melted and mixed in. Remove from heat. This entry was posted in Dinner, Main Dishes and tagged ground pork, mac and cheese, pasta, Sausage. Bookmark the permalink. Family loved it! I used gluten free macaroni and they never knew the difference. Has so much flavor! Almost too much actually, but I like this as a starting point for sure. And it is one pan and so simple. Usually home made Mac n Cheese comes out so bland, this gives it that kick it needs. Thank you for posting this. *Used 1/4 C of Heavy cream since I didn’t have half & half. I added an additional 1/4 water and some powdered milk to make up the 1/2 cup called for in the recipe but next time I will leave the extra 1/4 cup out as mine came out a bit too liquidy. *Reduced sausage/onion mixture to 3/4 lbs of sausage as it seemed like way too much sausage to pasta ratio. **NEXT TIME – Do not add salt. I think the cheese has enough salt – reduce liquid by a half a cup total – Maybe add another 1 cup of Cheddar – Use Medium Cheddar instead of Sharp as Sausage has enough bite. It will help mellow the dish. Ok. I’ve tasted this again after it has set and after I’ve given my taste buds a break. Reduce the water I used as stated by 1/4 a 1/2 cup. Reduce the added salt to nothing or just a smidge. the way I cooked it is awesome sauce 👍. This stuff is reeeeally good (see above for alterations). I super appreciate this recipe and as always, recipes can be tweaked to adjust to personal preferences. That’s the beauty of online recipes. They are an incredible starting point. To some this will be spot-on perfect. I promise 👍. And to others, their tastes needs to adjust it one way or the other. That’s okay. Personally, I have struggled finding a good Mac n Cheese recipe online that didn’t come out bland or just bad. This one, answered the call. It was just what the doctor ordered and so full of flavor. Add a can of tomato soup!!! It works magic!!! Great recipe. I actually didn’t use but one cup of cheese and it was still amazing. Loved it!!! Your a life saver!! Last minute recipe I made. It’s quick, easy and tastes amazing!! Going to make it again . Thank you so much!! Do you drain the grease from the cooked sausage crumbles? Yes, if there is a lot of grease, go ahead and drain it. Any recipe that uses Italian sausage I not only drain, but I also rinse it in a strainer. It makes a world of difference. Do you drain tomatoes ? I made this recipe and absolutely loved it ….I added some minced garlic and used a half a block of cream cheese as well and it was amazing ! Made this tonight. This is delicious. The only thing I did differently was to add a dashes of red pepper flakes and garlic pepper. Thanks for sharing this recipe. Will definitely be making this again. Made this tonight and it was delicious….definitely on my make again list and it was easy. This recipe is SO amazing — just wanted to comment and say thank you for giving me a delicious yet easy meal to add to my weekly rotation. Christin – Just found your website and I made this recipe as my first try out. It was delicious! Was looking for something quick and filling and this was it. The only things I changed were to use the spicy sausage (you are a SPICY southern kitchen) and to use beef broth instead of water. Was so delicious, I didn’t have many leftovers. Thank you for a wonderful recipe. Will be making this again! So happy everyone enjoyed it Maggie! Great recipe! It beats regular mac and cheese hands down! Is there a way to make this in the crockpot? Or do you think it would stay warm and dry out of places in crockpot afterwards? Thanks!!!! I’ve never made it in a crock pot before Morgan. I think you could leave it in a crock pot on warm for an hour or two. This was delicious! Made it with hot italian sausage and it was a huge hit with the boyfriend. It’s definitely staying on my bookmarked go-to recipes. So quick and easy on a weeknight. Looks great but I think I’ll try it with hot sausage rather than mild. You just took Mac N Cheese to the next level. Actually, I think this level is off the charts, somewhere above “uncontrollable drooling.” Bravo!! Delish! wonder what chirizo sausage would taste like instead of Italian? yeah!!! Stove top mac ‘n cheese is so quick and easy, and this looks sinfully good! Love the sausage and all that cheesy goodness! Just looking at that cheesy goodness is making me hungry! 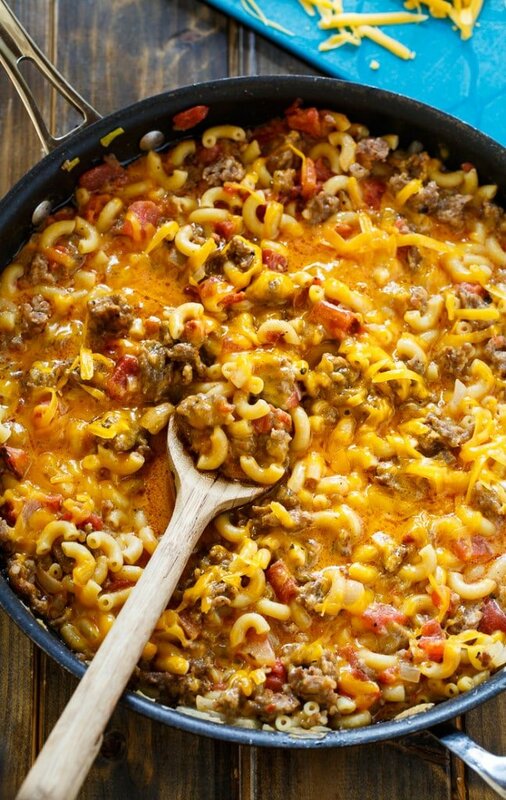 I’ve never added sausage to my mac and cheese, but it sounds delish! I love that this is made in one pot, too! This looks so delicious! All that cheezy goodness, all that pasta! YUM!! Love, too, that it is a one pot recipe and so quick to make…those are the best recipes, aren’t they 🙂 ? This looks so delicious!! All that cheezy goodness, all that pasta! Yum! Love that it is one pot and so quick to make, too….those are the best recipes, aren’t they 🙂 ? Oh, I know our family would love this! Interestingly enough, my 3 year old LOVES sausage and dislikes chicken and turkey, so this is right up her alley, especially with the mac and cheese! Looks awesome Christin! OMG, cheesy deliciousness up in here! 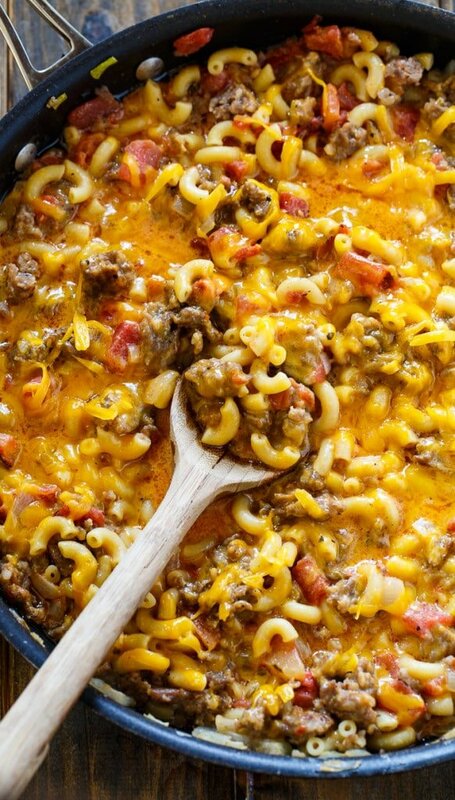 This sausage mac n’ cheese looks incredible, Christin! LOVING that this is made in one pan AND in 30 minutes! Talk about dinner perfection! So Yum! Cheers, friend! Oh my gosh. Mac ‘n’ cheese is my ultimate comfort food and this is absolutely calling my name right now! 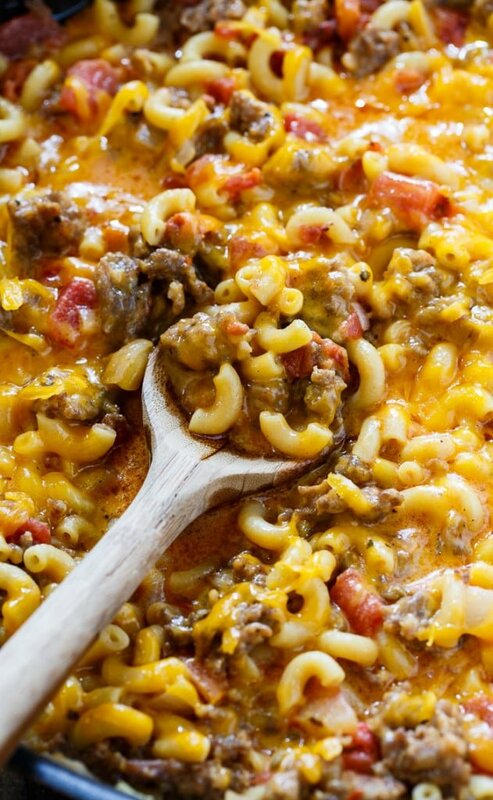 Love all that kickin’ sausage goodness you loaded into this mac, Christin! This looks SO good, Christin! I always love finding new mac ‘n cheese recipes, especially when it’s ready in 30 minutes. Love the addition of sausage in here!